I had the opportunity to help develop a new line of mutes for the trombone. My colleague, Richard Speetjens, French horn player in the Rotterdam Philharmonic asked my to help. I can tell you the result is absolutely super. It is a line of wooden mutes for tenor- bass- and contrabass trombone. The new shape of the mute together with the special work done on the wood and the small wholes at the side of these mutes make them play so easy. The complete register of the trombone is as easy to play as I have never been able to do on any other mute. Besides that the sound of the mute is just great and are so light and easy to handle. Specially for the late romantic repertoire these mutes are the solution to many problems. Some time ago I had to play the complete Miraculous Mandarin Ballet and it was just great to play it on this mute. The more then 20 glissandos from low B to F and back I had to play were for the first time in my life NO problem! But also the famous glissandos in the higher register just sounded great. I also used the contrabass mute several times now and this is just the very best mute to use on my contrabass trombone. It sounds a bit strange perhaps but the bone plays even easier with the mute then with out! The reactions of colleagues from other orchestras who tried the mutes are all positive and here in Holland, but also in Germany some of the leading orchestra already use them! Royal Concertgebouw Orchestra etc. etc. I highly recommend these new mutes! 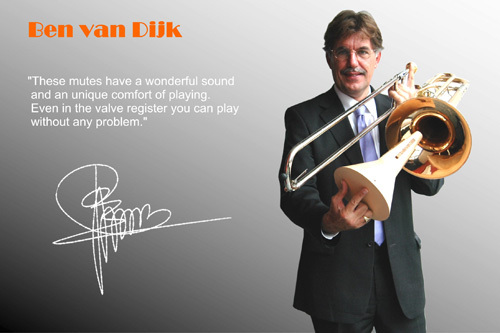 Bass trombonist of the Rotterdam Conservatory "Codarts" Ben is professor at the Rotterdam Conservatory "Codarts. He plays exclusively "Thein" tenor-bass and contrabass trombones.